Since I am not expecting to see a new car with a red bow on top of it for a Christmas present, I thought I would use the month of December to present gifts that I would absolutely LOVE to get (but never will). Of course they come along with full information about the artists’ interesting backgrounds. 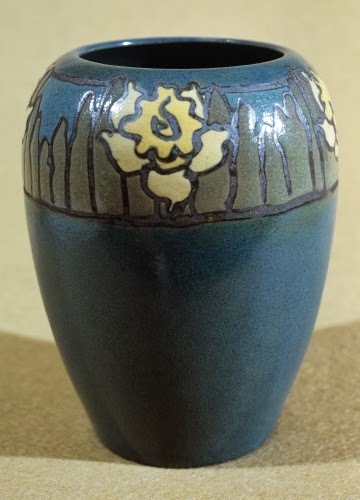 You all know my love of the genre called “American art pottery.” The Paul Revere Pottery Company is a particularly interesting example of how Americans have supported the arts. I present my first Fantasy Christmas Present. Yes, I would love a vase like this! I am particularly fond of Paul Revere Pottery, because the history of the company is a tribute to working women. I have maintained that women have always played a major role in American society, especially the arts. 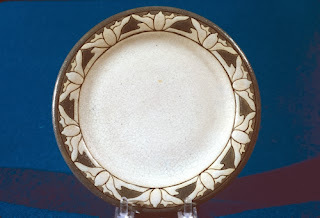 Paul Revere Pottery was founded by two women—Edith Guerrire and Edith Brown—who were concerned about the lives of immigrant women in he north end of Boston, mostly Italian and Jewish immigrants around the turn of the 20th century. These forward-thinking women had gone to Europe and seen art ceramics (in the Art Nouveau style), and conceived a plan to help make young immigrant women productive members of American society. Their goal was to educate young women in how to get jobs and be independent. Guerriere founded the Saturday Evening Girls Club to reinforce the view that women could be a valuable part of the American work force. Paul Revere Pottery evolved from this institution. The Storrow family, who had also established settlement houses for immigrant women, supported it. The pottery project was an effort to keep the young immigrant women off of the streets. It was established in the north end of Boston in 1909, after Brown and Guerriere had been experimenting with ceramics. What makes the story of Paul Revere Pottery interesting is the dignity with which the young women were treated who produced the pottery. Unlike the sweatshops of the time, the workshops of Paul Revere Pottery were well lit and well ventilated. The rooms always had fresh flowers and the workers were read to from Dickens, Shakespeare, and other great authors. The young women’s working day never exceeded eight hours, as opposed to the norm of the time of 10 to 12 hours. The workers got a half-day off on Saturdays and a two-week paid vacation! How’s that for fairness compared to a contemporary Congress that won’t even raise the minimum wage! Paul Revere Pottery closed for good in 1942. But it stands as a lasting example that no matter what the time period, there are people who think about bettering the lives of others. 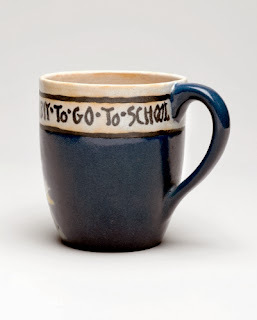 I think one thing that gets lost in current political debate is the on-going discrimination against people who are considered “others.” Paul Revere Pottery made an effort to change that mentality at the beginning of the 1900s! Studio activity: Create a clay container that can be used in daily life. Determine what uses the container will have. Use neat, even coils to build the container. Either smooth the coils of the vessel together or embellish it with incised, applied, or found object additions.